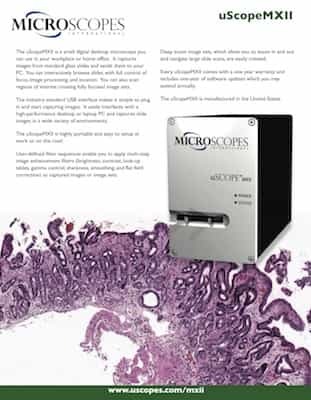 uScopeMXII Model Comparison :: Microscopes Intl. Dimensions 4.12" × 6.67" × 8.84"
104mm × 169mm × 224mm 4.12" × 6.67" × 8.84"
1 The uScopeMXII is a single-objective whole slide scanner. Each uScopeMXII model includes the specified objective (20x, 40x, or 60x). Neither digital pixel doubling nor interpolation are used to achieve the specified magnification. 2 The camera can operate in one of two modes: HD where each pixel on the image sensor maps to one pixel on the captured image; or SD where a 2×2 array of pixels is used to generate one pixel on the captured image (this is often referred to as binning). HD mode provides higher resolution images (comparable to the next higher magnification objective) where SD mode provides better contrast and less camera noise. 3 Z-Stacking simply means that the scanner captures several images at different focus levels for each field of view. 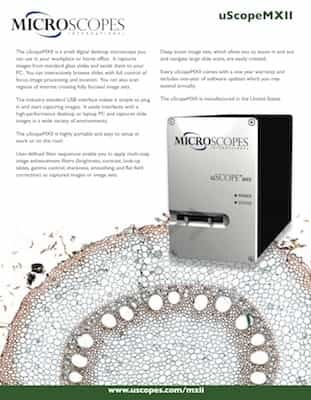 The uScope Navigator software composites these into a whole slide image with a focus adjustment that allows you to view each layer of the Z-stack using a natural control similar to the focus knob of a traditional microscope. Note: Z-Stacking requires significantly more time to scan a slide as many times more images are captured and saved to disk for each scan field. 4 EDF (extended depth-of-field) is an image processing technique that takes the best focus parts of each image from a Z-Stack and creates a new image where everything is in focus. This technique can be very beneficial for extremely thick sections where the natural depth-of-field of the objective is too shallow to show each discrete element in focus. Note: Optional software is required to create EDF whole slide images. Compositing EDF scan fields is a very processor-intensive operation that is best suited to multi-core CPUs. 5 The uScopeMXII offers a number of different focus methods to accommodate a wide variety of specimen types and preparation. 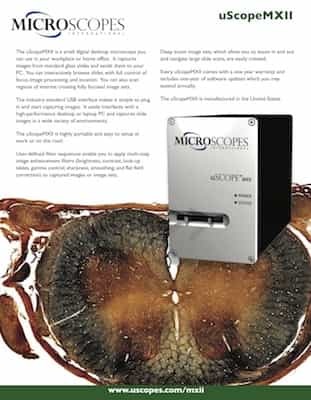 Specimens that are extremely thin can be scanned very well using predictive focus, fast stack, or even fixed focus. Thicker or inconsistent sections are best scanned with the exhaustive focus or predictive stack focus methods. 6 Scan speed is measured by scanning a 15mm×15mm area using the Predictive focus method. Fixed focus scans are slightly faster. Focus stack methods are slower (but may yield better focused images).